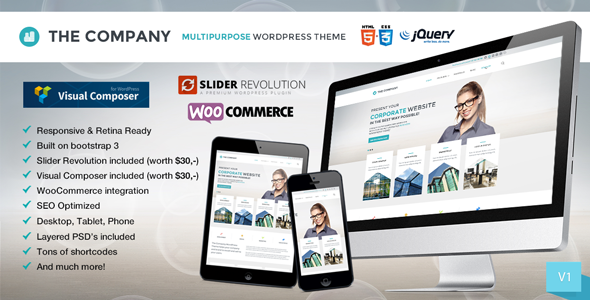 The Company is a multipurpose WordPress theme that will support you in creating your new websites! Build on Twitter Bootstrap – This theme uses Twitter Bootstrap as a strong foundation. This means that a range of shortcodes are automatically supported. For ease of use you can use the Visual Composer, Easy Bootstrap Shortcode or any other plugin to easily add visuals to your website. Mailchimp plugin support – This theme includes styling for the Mailchimp plugin! Content sections – This theme uses content sections to create page layouts. You can add normal content, portfolio items, blogposts and widgets to a section. Sections can even be re-used on other pages! Custom sidebars – Create your own sidebars and put them on any page you want! Maximum image quality – Made with optimal image quality in mind. We prevent WordPress from using JPEG image compression! Bye bye fuzzy images! Fully editable PSD files included! Item Reviewed: The Company - Responsive Multipurpose Theme 9 out of 10 based on 10 ratings. 9 user reviews.